Activists Say Syrian Death Toll Exceeds 17,000 : The Two-Way The pro-opposition Syrian Observatory for Human Rights estimates around 12,000 of those killed have been civilians. 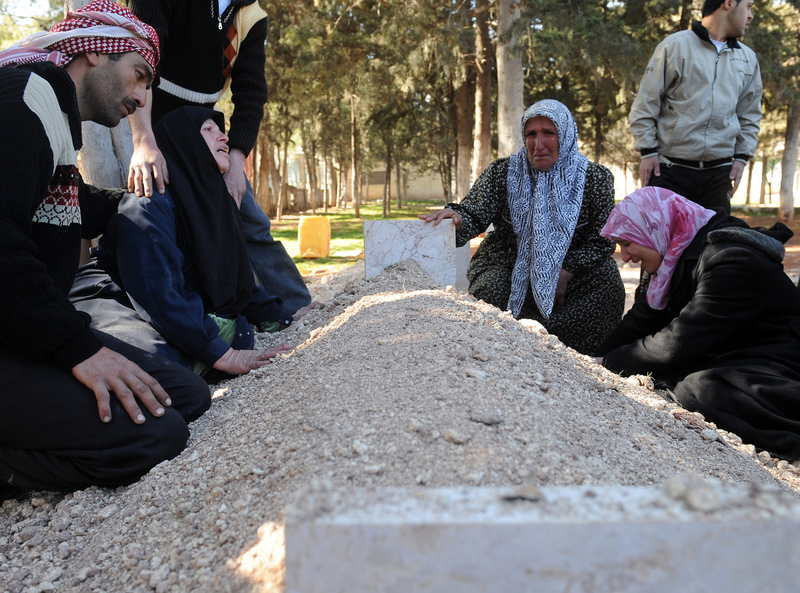 In February, these Syrians mourned over the fresh grave of a relative following a funeral for victims killed in violence in Idlib. Iran must be "part of the solution" to the crisis in Syria, former U.N. Secretary-General Koffi Annan said today in Tehran. But as Annan spoke, there was new word about how horrible things have gotten in Syria since protests against the regime of President Bashar Assad began in March 2011 and forces loyal to Assad cracked down on his opponents. An anti-Assad watchdog organization, the Syrian Observatory for Human Rights, said the death toll there has now exceeded 17,000. According to Thomson/Reuters' AlertNet, "the pro-opposition Observatory said at least 11,897 of [those killed] were 'civilians' — but added it could not determine how many of those might have been fighters who had joined an insurgency led by army defectors." Annan, the Associated Press reports, "was in Iran in a bid to salvage his faltering peace plan. ... A staunch ally of Syria, Iran has provided Assad with military and political backing for years, and has kept up its strong support for the regime since the Syrian uprising began. ... Annan did not say what kind of involvement he saw for Iran in resolving the crisis, nor did [Iranian Foreign Minister Ali Akbar ] Salehi spell out what Iran was willing to do to help tame the violence.